TAGLaw® founded in 1998, is a worldwide alliance of independent law firms. The alliance of more than 160 independent law firms in over 90 countries today ranks among the five largest legal alliances in the world. 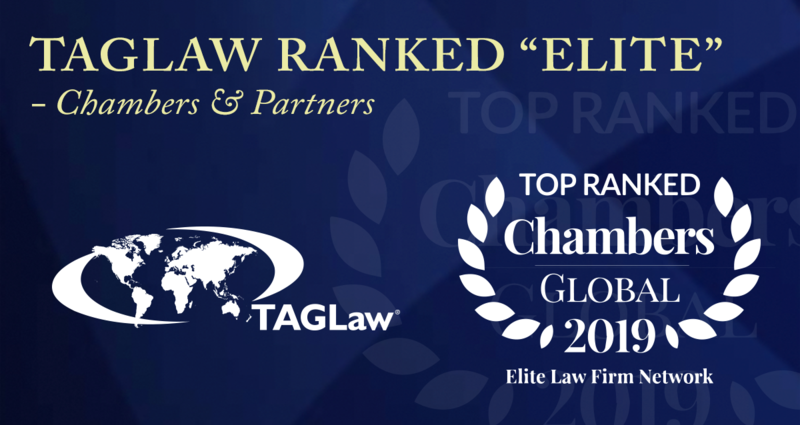 Learn more about TAGLaw’s “Elite” Ranking in Chambers Global 2019. TAGLaw members are highly-respected, value-driven law firms with local market knowledge and expertise. Members are carefully chosen based on their reputation and record, and on recommendations from existing members. Members undergo a rigorous screening process prior to invitation to the alliance, and are ultimately reviewed and approved by the TAGLaw Advisory Board. TAGLaw’s standards of excellence and integrity are the vital elements that assure clients will receive quality representation and a consistent level of professionalism. All TAGLaw firms agree to adhere to common objectives and standards, as documented in TAGLaw’s Standards and Charter. Provide excellent, timely and cost-effective legal services to clients of member firms. Develop and maintain strong client relationships and personal service, enhanced by the international resources shared among alliance members. Communicate clearly with clients on terms of professional engagement and progress of business. Share international expertise and resources with member firms. Provide referral opportunities to other members when appropriate. TAG Alliances® is comprised of the leading professional alliances, TAGLaw®, TIAG®, and its most recent addition, TAG-SP®. Together, TAG Alliances has a combined global reach of more than 290 members in over 105 countries with more than 17,000 professionals. We at LPA-GGV offer auditing, tax consulting and legal advice from a single source. That is why we are a member of both networks. Learn more about TAG Alliances at www.TAGAlliances.com.